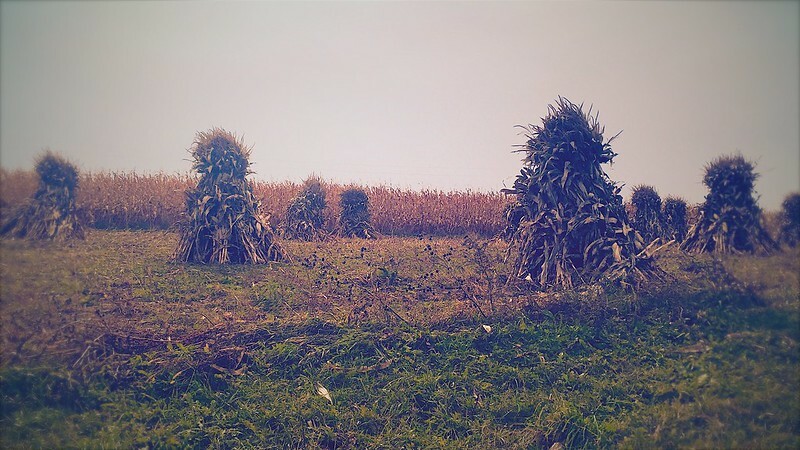 in amish country, ’tis the season for harvesting corn the pre-industrial way. 243/365. 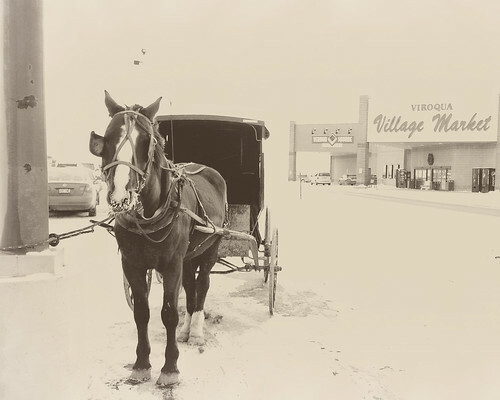 the amish honesty test. 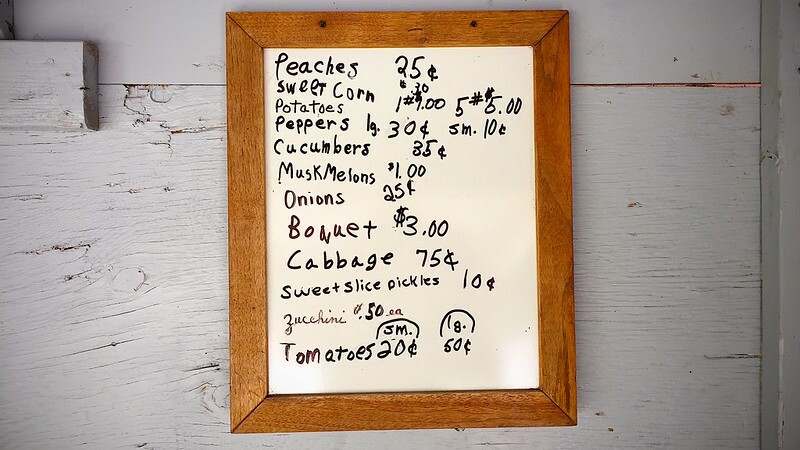 the price list at an amish produce stand on a quiet backroad in the country. no cashier stands waiting to collect your money. no video surveillance to try to keep you honest. just grab your produce and put the money in the can. use the money that’s there to make change if need be. i’m sure there are stands like this all around amish country across the u.s., i wonder if they have their own national honesty index. 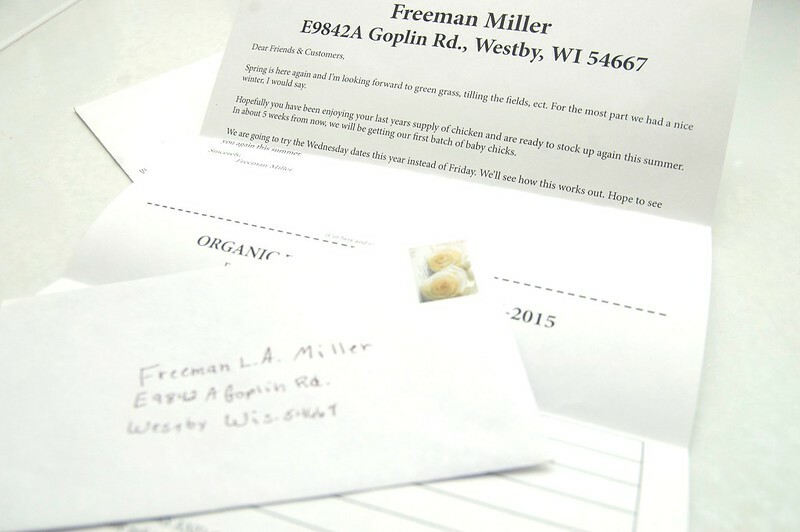 once a year we get a letter from a local, amish, organic poultry farmer named freeman miller. he asks us how many broilers we want and in the middle of the summer we get a postcard asking us to come pick them up on the day they are “processed” by hand. i enjoy the tradition of getting to go out and talk with freeman and see his children. often Odin comes along. it’s neat that some years we’ve been out of town and neighbors have been thoughtful enough to pick up our birds for us without asking since freeman has no refrigerated storage. i guess freeman must be getting more customers because the letters used to be handwritten. 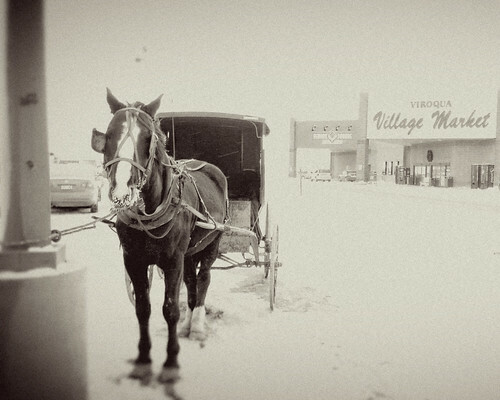 horse hitch at the village market triptych. how to get a good laugh from a wagon load of amish sawyers. well, you all did have suggestions and pretty much mostly everyone recommended avoiding pressure treated lumber when kids are going to be in regular contact with bare feet, if for no other reason than following the precautionary principle because there’s not-so-fun chemicals involved in pressure treating lumber. all a good reminder of something i already knew. but what wood to use instead of a pressure treated lumber that wouldn’t require treatment with chemicals to prevent rot? a bunch of local folks recommended finding an amish sawyer who would mill black locust which is extremely hard and renowned for its resistant to rot. local folks who build decks out of the wood claim you don’t have to do anything to it and it will last decades or longer. perfect! and as an added bonus i would be supporting local sawyers whichy is A Good Thing. with a handhshake i’d come back in 3 weeks. in the end, because of other obligations they needed 4 weeks to squeeze my order in, which puts me 7 weeks behind but i’m just happy to be making progress and doing it the way i want. i get ready to go out to the sawyers to pick up the wood with the vague idea that i’ll just make couple of trips in our jetta. i thought if i put the back seats down i could probably fit 8 feet in the car and have 6 feet hanging out the back, but i remembered the sawyer said he’d give me generous 14 foot boards, closer to 15 feet, so i’d have more than enough overhang to trim. right before i left to pick up the wood i thought i’d better measure how much room i had in the car with seats down and was suprised to discover i could only fit about 6 feet in the car. uh, oh. there was no way i could drive down the road with 9 feet of board hanging out the back of the car. so i quickly tried to procure a trailer or a truck and could only come up with a compact chevy s-10 on short notice which gained me a couple of feet with the gate down, which still meant i was going to have 7 feet hanging out. oh well, it was the best i could come up with so i figured i had to make it work and drove out the sawyer’s place. with the head sawyer, i loaded thirty two 14 foot boards in the bed of the truck and watched the bed sink lower and lower. because black locust is one of the hardest woods, it’s also veeeeery heavy, expecially when it’s still wet and from a freshly cut tree. the little chevy s-10 was sagging under the strain and the ends of the boards were really close to the ground after the wood were loaded. 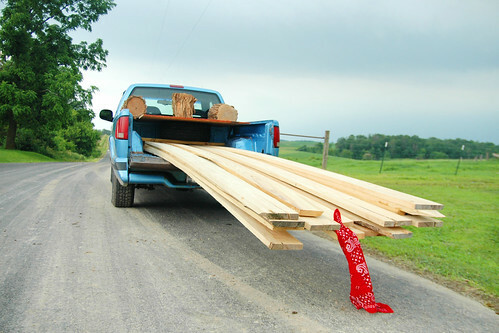 and even with the truck bed, the wood was teetering precariously. but ever the optimist, i thought i’d give it a test by driving a couple hundred feet from the saw mill to the end of the driveway. 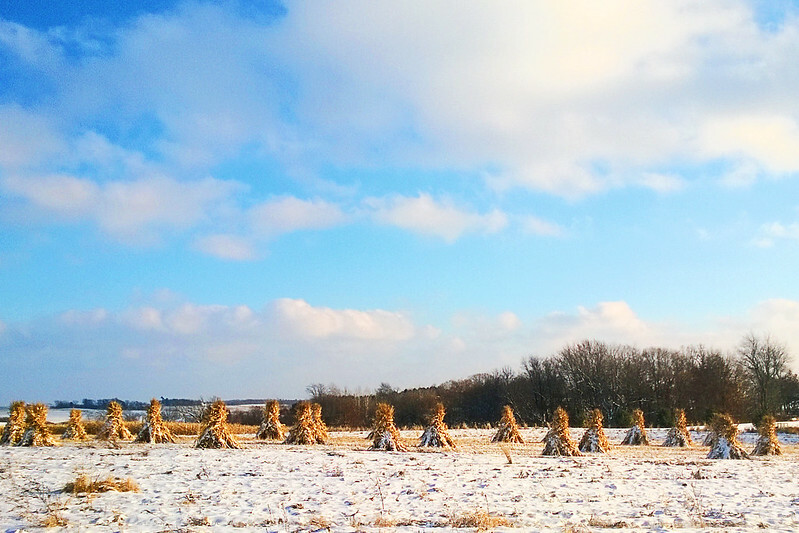 driving slowly up from the mill i could hear the boards dragging on the gravel driveway and slowly pulled up to a half dozen amish young sawyer men sitting on a huge hay wagon hitched to a team of very strong work horses. they all had big smiles on their faces. it was clear they they were all wondering if i was really going to try drive all the way back to town. 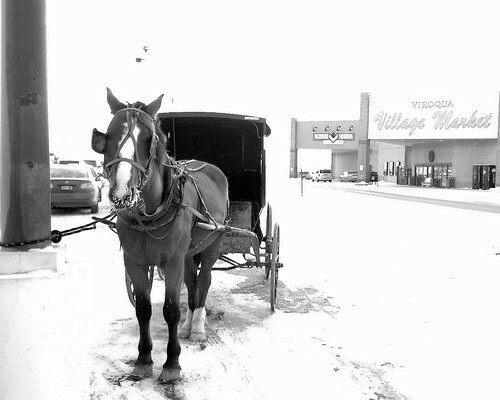 the juxtaposition of me in my little s-10 and they in their big horse-drawn wagon was amusing. they helped me unload half the wood and we rigged some plywood and a spare tire and some logs to weigh down the wood in the bed of the truck that kept the overhanging wood from barely dragging on the road and i set off for town, slowly.